Last night while preparing dinner, I listened to Tim Ferris interview Andrew Zimmerman a TV chef. 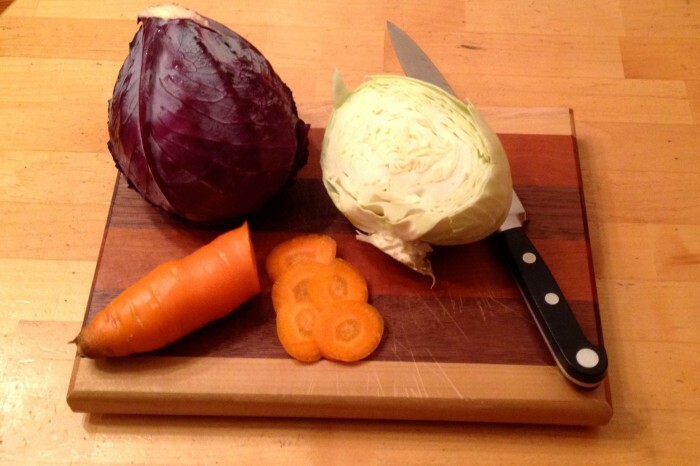 I chopped carrots and cabbage while they chattered on about spices, knife skills, travel and the food show. I was totally unprepared when, about 40 minutes in, Andrew launched into the tale of his earlier near-crippling addiction to drugs and alcohol. He told Tim that all addictions progress, as did his, until he was living in abandoned buildings in Manhattan. He lost his culinary jobs, his family and friends and sunk so low that he found himself sleeping on top of a pile of old clothes. Every night before he passed out he would throw Comet around him to keep the cockroaches and rats off. He was lucky because at some point he called a friend and got some help. He went to rehab and when he came out he wanted to start his life over again. Soon after, Andrew says that he noticed a big gap food media and decided he wanted to fill that gap. Imagine, just a few years post-homelessness and he is on the path to being a celebrity TV personality! His story illustrates an extremely important idea, that all successful people, great organizations and powerful brands of today started in a place that looked very much like where we are today. Perhaps they were even dealing with far harder circumstances than we are. But they set goals and went for it anyway. We like to look at the best of the best like Google or TED or Wired magazine and we say of course they can do it! They can offer exceptional products, experiences and connect with their community in deep meaningful ways. They have an amazing brand, tons of resources, lots of staff, oodles of money and customers that love them. Sure it’s easy to use them as an interesting example. But we can’t do what they do because we are not Google or TED or Wired. Here’s the thing. At one time TED wasn’t TED, TED was just an interesting little conference. Apple wasn’t Apple, Apple was a tiny tech startup with a design focus. Wired wasn’t Wired, Wired was a small circulation magazine with an appealing idea. The next time someone tells you something fascinating about an exceptional organization’s strategy, even though that organization is nothing like yours, try to find the analogy. How can you adapt that lesson for your own purposes and start building more success?